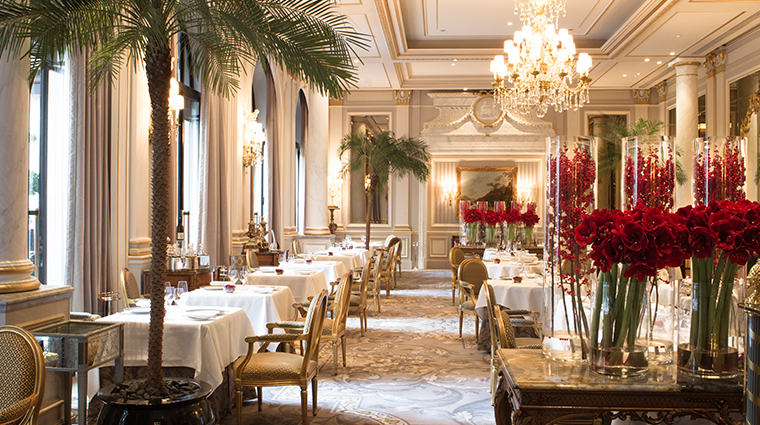 From the moment you walk through the golden revolving door into Four Seasons Hotel George V, Paris, you are transported to the early 1900s, a time when the city sparkled in all of its rich-textured and fine-tapestried grandeur. 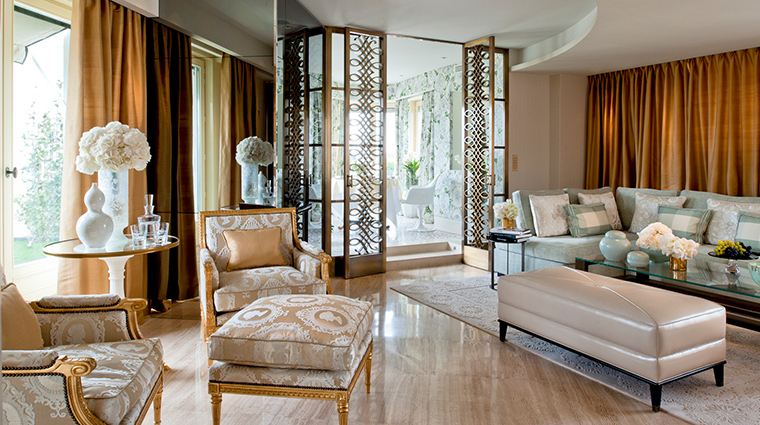 Of course, it manages to transport you to this elegant era while also offering reminders of the current times such as grand floral arrangements and a luxurious, modern spa. 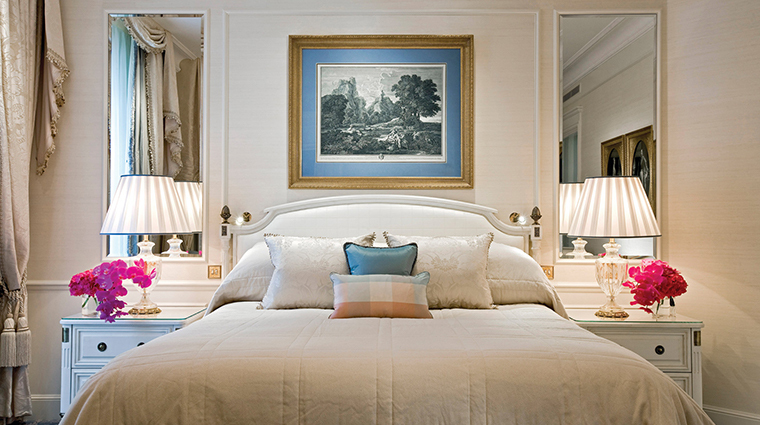 Over the last seven decades, the George V has established itself as much more than a hotel, though. The palace hotel has become an institution in Paris, not only for its architecture and style, but also for its role in setting the bar for the hospitality industry in the City of Light. 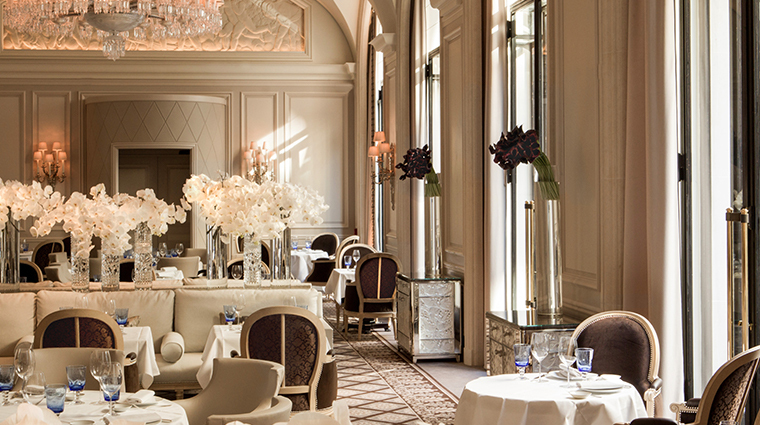 Renowned for its exquisite restaurants, La Galerie, L'Orangerie and Le Cinq, the swank Le Bar and unmatched concierge services, Four Seasons Hotel George V, Paris leaves no stone unturned. Stay at this luxury hotel and there will be no question that you’ve found one of the most extravagant and inviting places in the city. With only a few palace hotels in Paris, George V was originally designed in the 1920s by French architects LeFranc and Wybo. With the help of American architect Joel Hillman, the hotel opened in 1928 and, 70 years later, was added to the Four Seasons hotel collection. 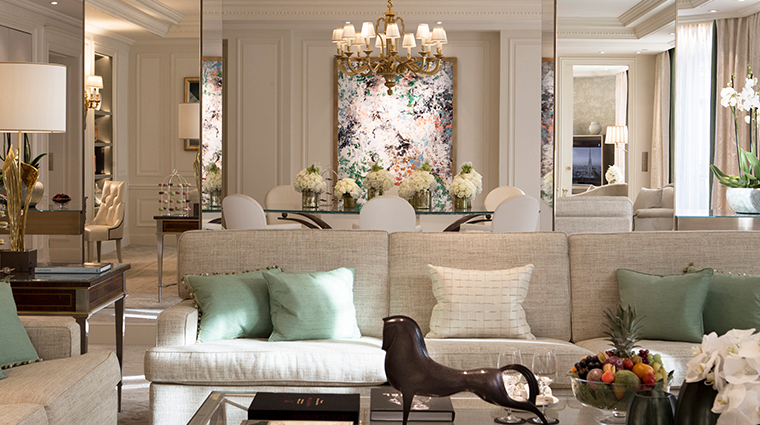 The George V will have the flowers and décor to complement the season. 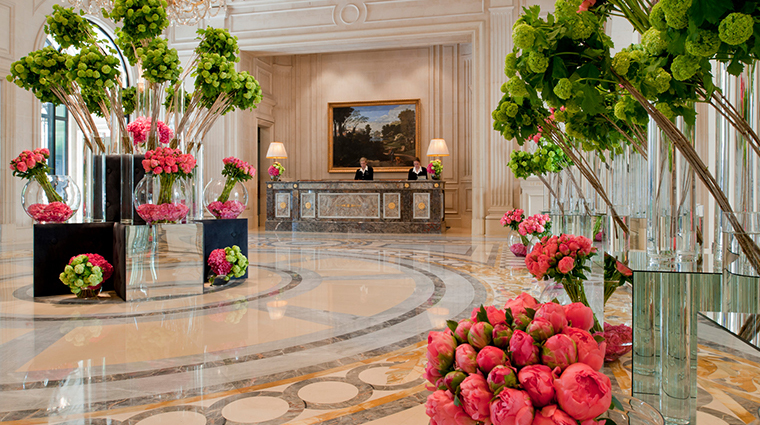 In the spring and summer, for example, immense arrangements of hydrangeas fill the lobby and marble courtyard. In the winter, the Christmas decorations are breathtaking, with hundreds of twinkling lights and trees filling the Galerie. Le Bar offers meals throughout the day, and serves as the perfect place to enjoy breakfast amidst the plush sofas and warmth of the wooden lounge. For lunch, Le Bar provides a menu filled with such items as the famous lobster club sandwich. 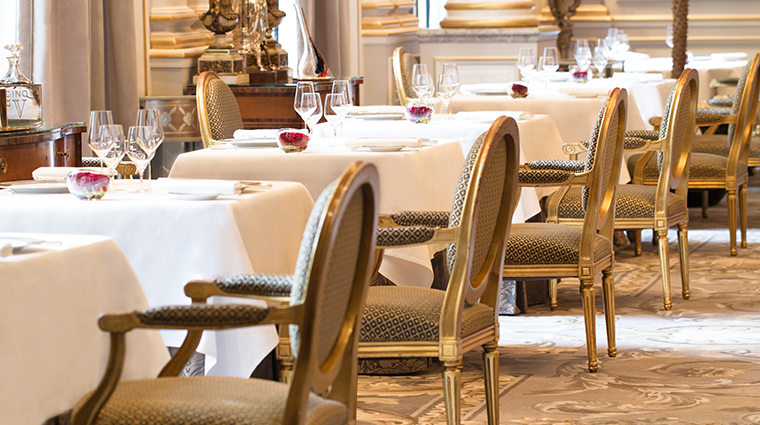 Another dining option is the property’s acclaimed restaurant, Le Cinq. Chef Christian Le Squer gives you the option of ordering off the menu — you can select seasonal dishes such as sautéed wild mushrooms or fresh sea bass — or following a set menu, with or without wine pairings. 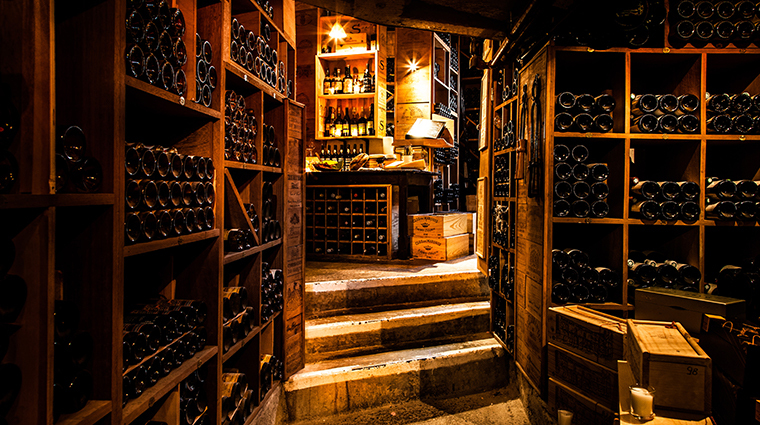 The entire George V property sits above a wine cave where about 50,000 bottles are stocked in a perfectly controlled atmosphere. Four Seasons Hotel George V, Paris is located in a neighborhood so appropriately named the Golden Triangle, created by the bordering streets of the Champs-Élysées, Avenue Montaigne and Avenue Georges V.
Known for its abundance of luxury shopping and dining, this area is also where the headquarters of Christian Dior, Givenchy, Saint Laurent and other iconic Parisian houses are located. The Paris hotel is ideally situated near major attractions such as the Eiffel Tower and the Grand Palais, but it’s not too far from other must-visit neighborhoods such as Palais Royal in the second arrondissement and Saint Germain on the left bank. 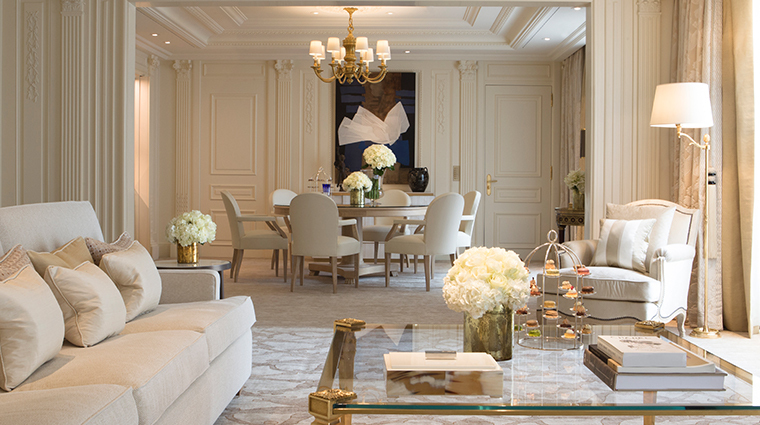 Inside Four Seasons Hotel George V, Paris, the décor pays homage to the grand dame era of Paris. Even when the hotel opened in 1928, the rooms are furnished with the latest technologies of the time. Modern spoils such as interactive television, 24-hour room service and in-room espresso machines are present in every room. 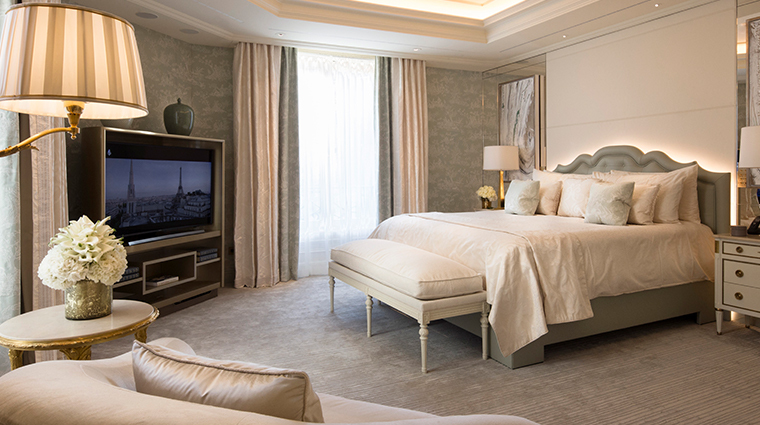 There are three styles of accommodations — premier, deluxe and superior — and each features slightly more luxurious perks, décor and walkable space than the next. All quarters are done in a typically French style, with 18th-century-inspired chairs and elegantly colored tapestries sitting just so to mimic the feel of a classic Parisian apartment. 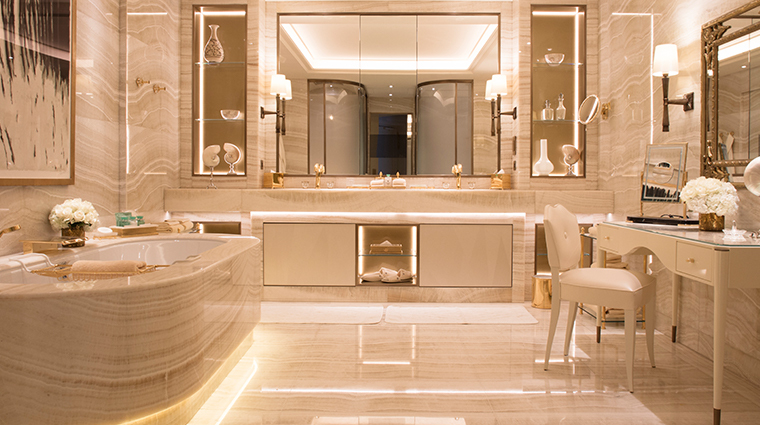 The luxury hotel’s 11 suites are extravagantly designed as well and come complete with exclusive amenities such as in-room fitness and dining space for eight. 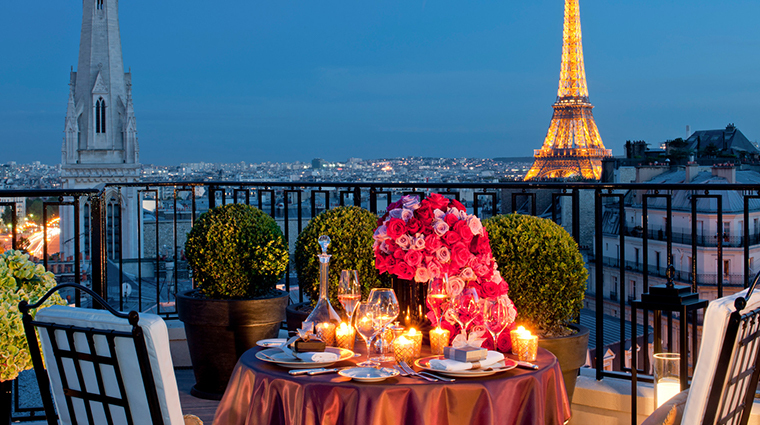 From the penthouse, you’ll see the Eiffel Tower sparkle at night and have the pleasure of dining on your balcony or the breakfast nook. 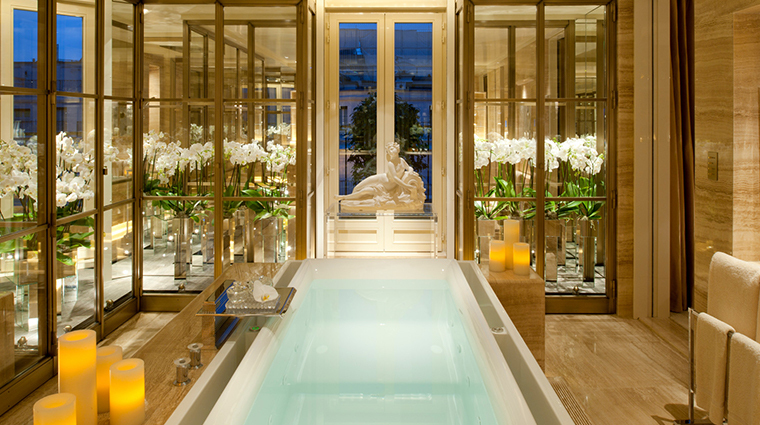 Four Seasons Hotel George V, Paris is an exquisite example of the grand dame style of Paris, reminiscent of a bygone era when the City of Light was undisputedly the most glamorous and wealthiest place in Europe. There was no expense spared during the construction of the hotel between 1920 and 1928. 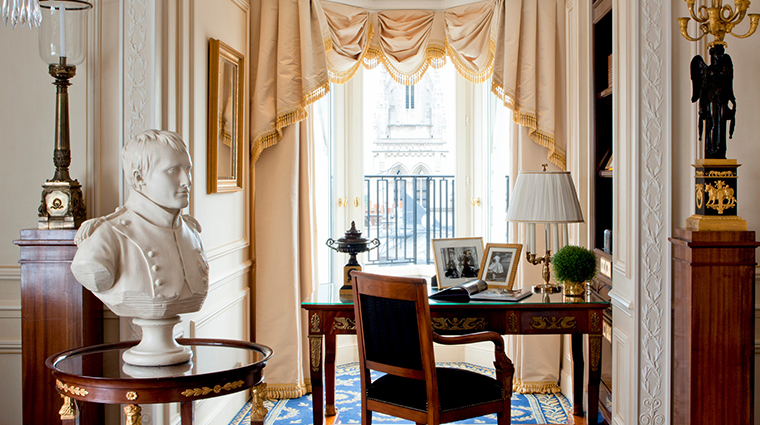 All public spaces were done with a certain regal air about them, while the guestrooms and suites were fashioned in a traditionally French style, with 18th-century-inspired chairs and elegantly colored tapestries providing the feel of a classic Parisian apartment. 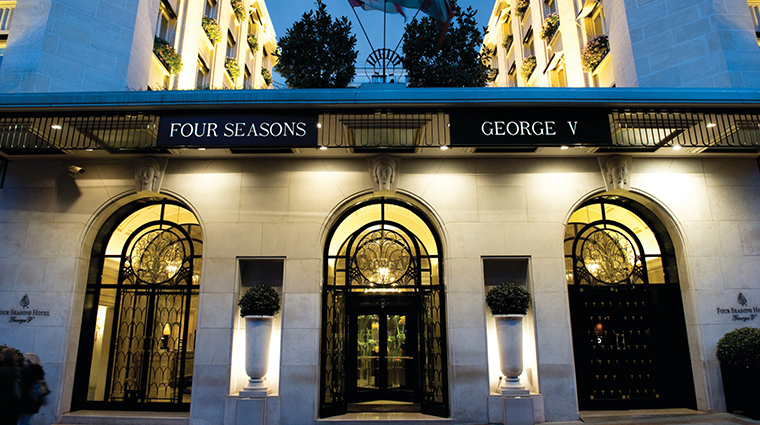 In 1999, when the Paris hotel joined the Four Seasons family, the George V underwent a two-year, $125 million renovation during which it was restored to its original grandeur while given a modern luxury update at the same time.